Made in Junee, New South Wales, 1960-1980. The principal ingredient of Friar’s Balsam is resin from the benzoin tree. This plant grows in China and South-east Asian countries, and the strong but pleasant-smelling liquid benzoin is used in incense and traditional remedies in those countries. In European societies, herbalists prescribe benzoin as an inhalant to help with respiratory disorders, and as a medication for treating urinary infections, relieving skin conditions and gout, and stimulating circulation. A small brown glass bottle with a cork stopper containing medicine known as 'Friar's Balsam'. The remaining medicine has solidified at the bottom of the bottle. 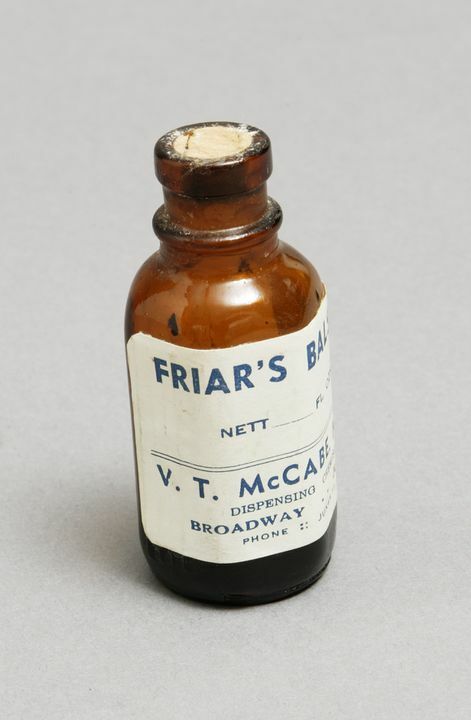 A white paper label is adhered to the body of the bottle and reads, 'Friar's Balsam ... VT McCabe MPS Dispensing Chemist, Broadway, Junee'. Friar's Balsam is an over-the-counter medication used for its antiseptic properties on small injuries such as cuts and abrasions, and for its expectorant properties for coughs, congestion and asthma. It is a tincture (alcoholic solution) whose principal ingredient is the gum from the benzoin tree (styrax benzoin). Text inscribed on label adhered to body of bottle, printed in blue "FRIAR'S BALSAM / NETT - FL. OZs / BROADWAY .. JUNEE / PHONE:: JUNEE 11". Inscription moulded into glass on body of bottle "NOT TO BE TAKEN". Inscription moulded into glass on underside of base "(unknown mark) / 1 8 849/3". The bottle of Friar's Balsam was made up by V.T. McCabe, M.P.S., Dispensing Chemist, Broadway, Junee, New South Wales, as indicated on the label. According to curator Richard Peck, the label looks like it was printed in the 1960s or 1970s by a printing works in Guildford (Sydney), which supplied chemist shops all over NSW. The Powerhouse collection includes material obtained from this business when it closed. Additionally, the phone number of chemist is given as Junee 11 on the label. Junee got an automatic telephone exchange on 14 March 1979, and this form of telephone number would have become obsolete at that time. The bottle was purchased by curator Megan Hicks in December 2002 from The Rock Antiques, a shop in The Rock. This is a town in the Riverina area of NSW, as is Junee, where the bottle originated. Nothing is known about its intervening ownership.